to start looking for them is right around sunset when they start getting active. Unless you already know where an owl roosts during the day, they are seriously difficult to find in daylight when they are not moving and look pretty much like whatever they are perched upon. 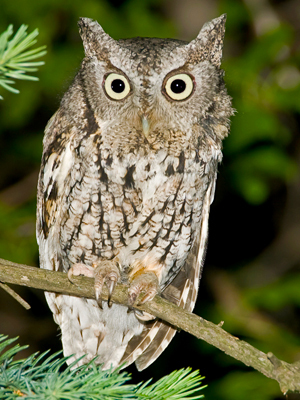 Owls can be active all night, but many peak in activity around dusk and dawn. Ask a local birding club for a good local place to look for owls, or find a quiet area that is wooded, or contains a mixture of open meadows and woods. Be sure to pick a safe place, always bird with a buddy, and bring a flashlight and extra batteries. Traditional birding requires a keen ear, but this is even more important with owling, as in the dark it is very difficult to see owls! Unless there is a moonlit night and one flies overhead and you can see the form, it is more likely that you will hear the owl calling. You may also hear the call in different locations as he moves around, or talks to another owl — which is a very cool experience! Finding owls requires a lot of patience — and silence — as owls tend to be very shy and don’t reveal themselves readily. To make any ID easier, since in most places there will be only a few possible owl species, take the time before you go to listen to owl calls and learn to identify the ones in your area by their distinctive calls. Since owls are not actively calling all the time, some people like to use pre-recorded sounds of the owls which are available in birding apps like our Wild About Birds! App. But playing the actual calls can cause the smaller owls which respond to calls from their species to be easier targets for any larger owls which might be around. Great horned owls are notorious predators, and teasing the smaller prey owls to speak up and reveal their location might result in their being attacked by a larger owl in the area. So be still and quiet, listen intently to any noises you hear, and if one sounds like one of the owls you know lives in your area, you can add that species to your list. Remember that identifying a bird by the call is just as sure an ID as a visual. And with owls, the call is more often the only opportunity you get to make the ID.